September 2018: From NOAA This short video, is the fifth in the National Academies Climate Change, Lines of Evidence series. It focuses on greenhouse gases, climate forcing (natural and human-caused), and global energy balance. Fact Sheet: a 4-page summary in dot points and figures. Briefing Material: slides used in the briefing providing a longer, visual summary. Article in The Conversation: a short summary and interpretation in accessible language. Australia’s Environment Explorer: a web atlas that allows you to visualise and investigate environmental changes by region, location or land cover type. 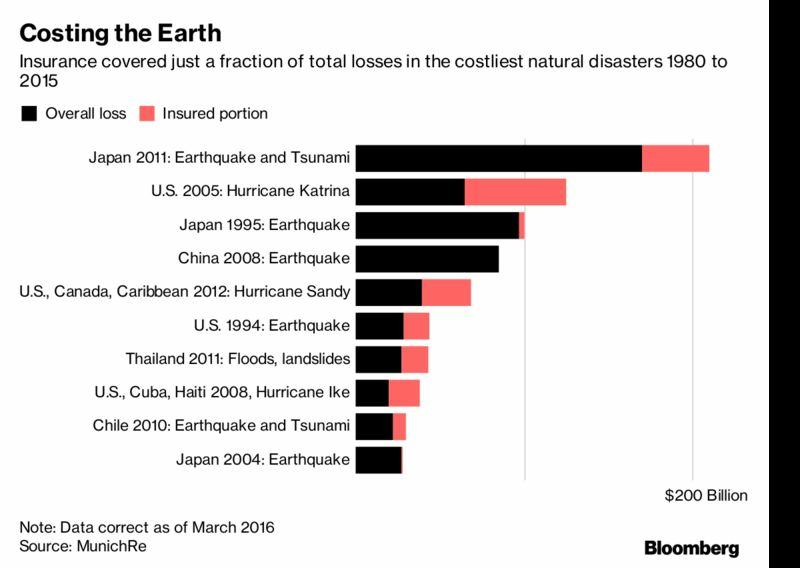 Australian natural hazards series – take your pick…. …. People often expect insurance to cover every kind of damage to their homes, but that is not always the case. The Climate Institute’s recent paper, There goes the neighbourhood states that, while insurers could do better in communicating increasing risks of extreme weather, we can’t expect the insurance industry to protect us from all the costs of increasing frequent and extreme weather events. The same goes for local government-funded mitigation such as seawalls and groynes, which are costly and can be extremely contentious among local communities, as events in Byron Shire illustrate. There goes the neighbourhood points out that states and the federal government need to take stronger action to coordinate information and responses. They will also need to take stronger action to help limit global warming driving climate impacts. Is it time to join the dots? Australia’s climate has warmed in both mean surface air temperature and surrounding sea surface temperature by around 1 °C since 1910. The duration, frequency and intensity of extreme heat events have increased across large parts of Australia. There has been an increase in extreme fire weather, and a longer fire season, across large parts of Australia since the 1970s. May–July rainfall has reduced by around 19 per cent since 1970 in the southwest of Australia. There has been a decline of around 11 per cent since the mid-1990s in the April–October growing season rainfall in the continental southeast. Rainfall has increased across parts of northern Australia since the 1970s. Oceans around Australia have warmed and ocean acidity levels have increased. Sea levels have risen around Australia. The rise in mean sea level amplifies the effects of high tides and storm surges. Limited water resources in southern Australia, due to higher temperatures and decreased rainfall. Increased drought frequency is expected in southern Australia, with decreases in the amount of rainfall by as much as 10% by 2030, and by up to 30% by 2070. These upper-limit scenarios would have important implications for regional agriculture, rural livelihoods, ecosystems, and urban water supply. Uncertainty in the scale of projected rainfall changes means that effective adaptation to these risks will be particularly challenging. An increased number of hot days is one of the most direct consequences of global warming. Air temperature in Australia has increased at a rate of 0.09°C each decade since 1911. Since 1950 there has been significant warming across the continent, particularly over inland areas. Hot days and hot nights have become more frequent. Similarly, hot extremes have become more frequent and intense, while cold extremes have become rarer. Increased hot weather is expected to have significant impacts in major population centres, with hot days, for example, in Melbourne expected to increase 20 – 40% by 2030, and up to 190% by 2070. Heatwaves to increase in frequency and intensity. The 2009 Victorian heatwave was associated with over 300 excess deaths and contributed significantly to increased heat-related morbidity. Vulnerable sections of society, such as the elderly and people with pre-existing medical conditions, will be affected disproportionately. The intense 2009 Victorian bushfires caused 173 deaths and destroyed over 2,000 buildings. Similar bushfire events may become more frequent. Australian fire danger weather has increased in some areas around Australia since the 1970s. Hotter and drier conditions in southern Australia mean that fire danger weather is projected to increase in this region. Under certain scenarios, Australia is likely to see an increase in days of very high and extreme fire danger. For example, Canberra currently experiences an average of 17 days per year of very high and extreme fire danger index. This is expected to increase to 18-23 days by 2020, and to 20-33 days by 2050. The severity of some key regional risks is dependent on a large range of climate variables, even for a particular global average temperature increase. However, if the most extreme scenarios occur, these risks would be severe. Widespread drought in southeast Australia (1997-2009), including the southern Murray Darling Basin was associated with a decrease in southern Murray Darling Basin GDP by nearly 6% in 2007/2008. Dry conditions and resulting economic downturn can have substantial impacts on local industry, the national economy, and the health (particularly mental health) of rural communities. There has been an ongoing debate, over recent years, fuelled by deniers about the stopping or slowing trend of increasing surface temperatures. Earth systems are complex and science understanding continues. 4 June 2015, Carbon Brief, No ‘slowdown’ in global surface temperatures after all, study finds. A new paper published today says the much-discussed “slowdown” in warming at Earth’s surface may not exist after all. The so-called “hiatus” has never been about a reduction in the speed of “global” warming. It relates only to the temperature at the Earth’s surface. When you look at all the components of the climate system – land and vegetation, ice cover and the ocean – scientists have no doubt that the planet as a whole is warming up. Since the IPCC report, a lot of research has been published looking at how natural variability could be contributing to slower surface warming by reshuffling heat between the atmosphere and the oceans. On top of the long-term warming trend from greenhouse gases, these natural fluctuations in the climate system can temporarily boost or dampen the speed of warming, causing global temperatures to temporarily rise above or below the long-term average. Scientists use thousands of temperatures measurements from ships, drifting buoys and weather stations on land to construct records of global temperature. The new paper addresses some well-known issues with how the data is all pieced together. First, is how to combine traditional ship-based measurements of sea surface temperature with those collected by the ARGO network of free-floating buoys, operating since the early 2000s. Another issue is how to account for changes over time in the way ships collect temperature data while on the move. There is also the well-known problem of having little data available in the Arctic. Scientists have developed various ways to “correct” for all these issues. The new paper uses an approach developed by NOAA scientists – some of whom are authors of the new paper. While the authors apply their corrections to the full temperature record stretching back to 1880, the biggest impact is on the rate of warming in recent decades, say the authors. 26 February 2016: A new NASA visualization shows the 2015 El Niño unfolding in the Pacific Ocean, as sea surface temperatures create different patterns than seen in the 1997-1998 El Niño. Computer models are just one tool that NASA scientists are using to study this large El Nino event, and compare it to other events in the past. Access website page here for more. You are a snail. You are a plant. You like where you are. The temperature’s right. It suits you. But then, gradually, over the years, it gets warmer. Not every day, of course, but on more and more days, the temperature climbs to uncomfortable highs, drying you out, making you tired, thirsty. Something is not right. And though you can’t know this, there’s a reason: The whole planet is getting warmer, which means that temperature zones are shifting. Warmer areas are expanding, pushing cooler zones closer to the North and South Poles, so that the meadow, the forest, the tundra, the desert, the plains — wherever you live — your ecosystem is beginning to shift. In 2009, they came up with an answer, published in the science journal, Nature. As a global average, they said, temperatures are changing at a rate of 0.42 kilometers — or roughly, a quarter mile a year, which means that if you are standing on a patch of earth, climate zones are moving at a rate (on average) of about 3.8 feet every day. Think about this for a moment. For birds, butterflies, bears — critters with legs and wings — catching up with your old climate (as it moves away from you at 3.8 feet a day) seems very doable. If you’re a lot smaller — a snail, a beetle — it’s harder. And if you can only wiggle, like an earthworm, it’s even rougher. But, in general, a 3.8-feet-a-day rate seems hard, but not impossible. Remember, however: This is an average, and averages can mask very different underlying rates. Everybody knows temperatures change very fast when you are climbing a mountain. Mountains are change-friendly. To get a little cooler, all you have to do is climb a small distance. But to get a degree or two cooler on flatter land (on the plains, grasslands, in a rural area), you may need to travel a half mile or more every year to keep your climate constant. For a beetle, a snail, that’s a hike. And if there are highways, fences, shopping malls in your way, the trip may be impossible. Even mountains have their problems. The higher you go, the narrower it gets. Some critters can move up, but not everybody. It’ll get too crowded. So far I’ve only mentioned animals, but animals have to eat, nest, seek shelter. It’s no good moving to a place where the berries you need, the leaves you need aren’t available. Some moving animals need moving plants. Can plants do it too? Well, in a way they can. Trees, for example, can push their seeds in a desirable direction. After the last great ice age, as it warmed, temperate forests (with help from birds, wind and berry-eating bears) moved north at a rate of more than half a mile per year. This time, can the plants keep up? Dashing Trees: Miles Silman, a forest ecologist at Wake Forest University, has been pondering this question. He (and others) have been looking hard at patches of forest on the slopes of the Andes mountains in Manú National Park in Peru. The trees in each patch have been counted, measured, watched, providing a good baseline to see how things have changed. As described by Elizabeth Kolbert in her new book, The Sixth Extinction, one of Silman’s grad students, Kenneth Feeley, and his colleagues discovered that trees on these mountain slopes are already in motion. Not all trees, though. Just some. Feeley looked at changes over a 4-year period, and found that trees have been moving up to get cooler at an average rate of 8 feet a year; but some, Kolbert writes, were “practically hyperactive.” Trees from the genus Schefflera, (which we know as part of the gingseng family) were “racing up the ridge at the astonishing rate of nearly a hundred feet a year.” Wow! “As the climates change,” Chris Field said in the podcast, “plants and animals, at least in principle have the potential to stay in the climate they’re in now. … But the conclusion from our study is that they have to move pretty fast in order to be able to do that.” And a lot of them, Field thinks, won’t make it. Some animals will migrate north, but won’t find the food they need. Trees may find new zones, only to be inhabited (or attacked) by a new set of animals and pests. Old arrangements will break down. The key, say the authors of this study, is to make sure movement is possible. What about our National Parks? We have, of course, set aside huge swaths of land to protect plants and animals. We’ve got Yellowstone, and even bigger African preserves. But the temperature zones are moving so fast, the Carnegie scientists say, that even in these immense spaces, less than 10 percent of protected areas globally will maintain current climate conditions within their boundaries 100 years from now. That’s going to be a problem. Picture a whole lot of animals (and plants) moving north (or south), trying to stay cool, until eventually they come to the edge of their Canadian, African, Russian or American national park, which is bordered by hotels, motels, car parks, guide centers, roads, power lines. We humans, having tried to stay out their way, are now back in their way. We need to back off and let them through — but will we? I wonder. An excellent resource well worth investigating: The Climate Change in Australia website provides easy access to the projections information and data. The website houses 14 interactive tools for exploring data; a data download facility; a technical report describing the data sources, methods, observed changes and projections; reports and brochures that summarise the results for eight regions of Australia; a brochure on Data Delivery; a brochure on projections for selected cities; a Climate Campus for learning more about climate science and using projections in impact assessments; an online training course; and other resources for decision makers and communicators. It is often stated that people have been dealing with “extreme events” ever since Adam was a boy, what is so different with climate change? The difference is that it is projected that as temperatures rise not only severity increases but the number of occurrences can also increase. The outcome being people/communities do not have time to recover fully before they face another “event”. How are extreme events changing? Australian Academy of Science: With its iconic reference to ‘droughts and flooding rains’, Dorothea Mackellar’s 1904 poem My Country highlights the large natural variations that occur in Australia’s climate, leading to extremes that can frequently cause substantial economic and environmental disruption. These variations have existed for many thousands of years, and indeed past floods and droughts in many regions have likely been larger than those recorded since the early 20th century. This high variability poses great challenges for recording and analysing changes in climate extremes not just in Australia, but the world over. Nevertheless, some changes in Australia’s climate extremes stand out from that background variability. Human-induced climate change is superimposed on natural variability. For example, in recent decades, hot days and nights have become more frequent, more intense and longer lasting in tandem with decreases in cold days and nights for most regions of the globe. Since records began, the frequency, duration and intensity of heatwaves have increased over large parts of Australia, with trends accelerating since 1970. Figure 5.1: Temperature extremes change as average temperature increases. In this schematic illustration, the increase in average temperature is shown by the sloping line on the right. The idealised temperature time series has similar variability throughout the whole record. In the latter part of the record, the hot extremes threshold is exceeded progressively more frequently. Source: Working Group for this document. 1. Climate change is increasing the risk of bushfires in Victoria and lengthening fire seasons. Extreme fire weather has increased since the 1970s in the east and south of Australia, including Victoria, with the fire season length extending from October to March. Climate change is now making hot days hotter, and heatwaves longer and more frequent. Drought conditions have been increasing in Australia’s southeast. Climate change is driving an increase in dangerous fire weather, which in turn is increasing the frequency and severity of bushfires. 2. Victoria is the state in Australia that is most affected by bushfires and is on the frontline of increasing bushfire risk. The 2016–17 bushfire season in Victoria is expected to be ‘above normal’ for the majority of the state including the Melbourne hinterland. Severe long term rainfall deficits remain across much of western Victoria and West and South Gippsland, which may increase fire risk. Very wet winter and spring conditions has led to high levels of grass growth and above average fuel loads, particularly in the north of the state. 3. The economic cost of bushfires in Victoria is projected to more than double by 2050. Victoria has sustained around half of the Australian economic losses from bushfires despite comprising only 3% of the continent. The annual economic cost of bushfires in Victoria is approximately $180 million. By around the middle of the century these costs could more than double to $378 million. These projections do not incorporate increased bushfire incident rates and severity due to climate change, so the total cost is likely to be much higher. 4. Bushfires will continue to adversely affect human and environmental health. More than two thirds of known civilian bushfire fatalities in Australia have occurred in Victoria (more than 450 fatalities since the start of the 20th century). Bushfire smoke can seriously affect human health because it contains respiratory irritants, as well as inflammatory and cancercausing chemicals. Elderly, infants and those with chronic heart or lung diseases are at higher risk. After the 2009 Black Saturday bushfires, some members of the community developed Post Traumatic Stress Disorder, major depressive episodes and increased alcohol use. Fires can affect water infrastructure. The Black Saturday fires affected about 30% of catchments supplying Melbourne’s drinking water, with estimated recovery costs totalling more than $2 billion. Increasing fire frequency can cause rapid ecosystem change. After successive fires in 2003 and 2006–07, acacia shrublands replaced some mountain and alpine forests, putting at risk vertebrate species including the endangered Leadbeater’s possum. 5. In the future, Victoria is very likely to experience an increased number of days with extreme fire danger. Communities, emergency services and health services across Victoria must keep preparing. Fire severity and intensity is expected to increase substantially in coming decades in Victoria. The fire season will continue to lengthen, further reducing the opportunities for safe hazard reduction burning. Melbourne’s rural-urban fringe is among the most vulnerable in the world to bushfires. The population of Melbourne is continuing to spread, encroaching into surrounding bushland, increasing risk to life and property from bushfires. An increased likelihood of dangerous fire weather and a lengthening fire season will strain Victoria’s existing resources for fighting and managing fires. 6. Reducing emissions is critical to protecting Australians. Australia must cut its emissions rapidly and deeply to join global efforts to stabilise the world’s climate and to reduce the risk of even more extreme events, including bushfires. Australia’s very weak target of a 26-28% reduction in emissions by 2030 compared to 2005 levels – and we are on track to miss even this target – leaves Australia lagging well behind other OECD countries. Sept 2010, NASA Thousands of wildfires large and small are underway at any given time across the globe. Beyond the obvious immediate health effects, this “biomass” burning is part of the equation for global warming. In northern latitudes, wildfires actually are a symptom of the Earth’s warming. ‘We already see the initial signs of climate change, and fires are part of it,” said Dr. Amber Soja, a biomass burning expert at the National Institute of Aerospace (NIA) in Hampton, Va.
16 December 2015, CSIRO and Ngadju tackle bushfires in the Great Western Woodlands. Old and new ways of fire management are coming together to help protect one of the most unique woodlands on the planet. Members of the Ngadju community began working with CSIRO about four years ago to help prevent fires in the Great Western Woodlands (GWW) in south-western Australia. The Great Western Woodlands are located in south-western Australia. From the Climate Council of Australia’s report – Be Prepared: Climate Change and the Victorian bushfire threat (2014). The Australia Seasonal Bushfire Outlook for 2014–15, issued in September 2014, anticipates the severity of the bushfire season in different states. For the first time this outlook has been reissued (November 2014) due to unseasonably hot, dry weather in Australia’s southeast (See Figure 7). Victoria’s 2014–15 bushfire season outlook has been upgraded from an above normal fire season to a major fire season. All Victorian districts, except the Mallee and East Gippsland, may expect above normal fire potential (Bushfire and Natural Hazards CRC 2014b). 3 June 2014, ABC Catalyst: How will the rise of mega-fires affect life as we know it? Reporters Anja Taylor and Mark Horstman travel to opposite sides of the planet to find out. Even the origin of fire is tied to the origin of plants. Fire couldn’t exist here until the fuel and oxygen from land plants made this planet flammable. So for nearly half a billion years, the Earth has been in flames. In turn, fire shapes the patterns of life, the climate, and ultimately, our own survival. But fire is changing. Over the past decade, every forested continent has seen an alarming surge in large, uncontrollable fires. Mega-fires. In just 90 days, more than 205 records were broken around Australia. The state-wide mean temperature in summer was the hottest for New South Wales since records began, with temperatures 2.57°C above average. Sydney had its hottest summer on record with a mean temperature 2.8°C above average. Brisbane had its hottest summer on record in terms of mean temperature at 26.8°C, equivalent to 1.7°C above average. Canberra had its hottest summer on record in terms of daytime temperatures and recorded temperatures of at least 35°C on 18 days, already far higher than what is projected for 2030 (12 days). Adelaide experienced its hottest Christmas day in 70 years at 41.3°C. Moree in regional New South Wales experienced 54 consecutive days of temperatures 35°C or above, a record for the state. Perth had its highest summer total rainfall on record of 192.8 mm. 2. Climate change is driving hotter, longer lasting and more frequent heatwaves. The 2016/17 extreme summer heat in New South Wales was at least 50 times more likely to occur due to climate change. Protecting Australians from the impacts of summers with relentless extreme heat requires the uptake of cheap, clean and efficient renewable energy and the phasing out fossil fuels. Commissioning new fossil fuel (coal, oil and gas) projects is incompatible with limiting the dangerous impacts of climate change, such as the failure of critical infrastructure. 3. Escalating extreme weather is putting Australia’s ageing energy system under intense pressure. Australia’s energy system is ageing, inefficient and polluting, and during the Angry Summer proved unable to cope with escalating extreme weather, like heatwaves. Days of extreme heat and heatwaves will become even more frequent and severe in Australia, and will increase the risks to critical infrastructure (e.g. electricity), the economy, health and ecosystems. 4. The costs of the extreme heat are clear with reduced work productivity, increasing risk of bushfires and escalating damage to the Great Barrier Reef. The impacts of the last Angry Summer of 2013/14 cost the Australian economy approximately $8 billion through absenteeism and a reduction in work productivity. The economic impact from the 2016/17 Angry Summer has not yet been quantified. Above-average sea surface temperatures this summer have triggered a new bleaching outbreak on the Great Barrier Reef. This follows the worst mass bleaching event in the reef’s history in 2016. Extreme fire weather is increasing in Australia’s southeast. During the most severe heatwave of this recent Australian summer, nearly 100 bushfires were ignited and raged through parts of inland New South Wales. Why do sustained extreme high temperatures kill? 23 July 2010, Scientific American, How Does a Heat Wave Affect the Human Body? Some might like it hot, but extreme heat can overpower the human body. An expert from the CDC explains how heat kills and why fans are worthless in the face of truly high temperatures. Climate change promises to bring with it longer, hotter summers to many places on the planet. With more heat waves on the horizon, the risk of heat-related health problems has also been on the rise. Heat exhaustion is a relatively common reaction to severe heat and can include symptoms such as dizziness, headache and fainting. It can usually be treated with rest, a cool environment and hydration (including refueling of electrolytes, which are necessary for muscle and other body functions). Heat stroke is more severe and requires medical attention—it is often accompanied by dry skin, a body temperature above 39.4 degrees C, confusion and sometimes unconsciousness. But when sustained heat waves hit a region, the other health ramifications can be serious, including sunstroke and even major organ damage due to heat. As temperatures linger above our bodies’ own healthy internal temperature for longer periods of time, will we humans be able to take the heat? Mike McGeehin, director of the CDC’s Environmental Hazards and Health Effects Program, provides some answers. Continue reading here for his answers. Climate change is influencing all extreme rainfall events. The warmer atmosphere holds more moisture, about 7% more than previously. This increases the risk of heavier downpours. Globally, there are more areas with significant increases in heavy rainfall events than with decreases. Extreme rainfall events like the Victoria rains are expected to further increase in intensity across most of Australia. While there isn’t a significant trend in observed extreme rainfall in Victoria yet, maximum one-day rainfall is projected to increase by 2-23% in Victoria by the end of the century if greenhouse gas emissions continue to rise. It is critical that communities and emergency services have access to information about rainfall in a changing climate to ensure they can prepare for the future. THE INFLUENCE OF CLIMATE CHANGE ON HEAVY RAINFALL: The heavy downpours across southeast Australia are yet another reminder of how extreme weather events place lives, property and critical infrastructure at risk. Climate change is intensifying many extreme weather events in an atmosphere that is warmer and wetter because of increasing greenhouse gas emissions from human activities, primarily the burning of fossil fuels – coal, oil and gas. 30 March 2017, Climate Council Fact Sheet: Tropical Cyclones and Climate Change. Cyclone Debbie, a devastating category 4 storm, ripped through north Queensland on 28 March 2017. The storm has prompted many people to ask the Climate Council about the influence of climate change on tropical cyclones. This Fact sheet provides an overview of the role that climate change is playing in influencing tropical cyclones. Future projections indicate that an increase is likely in the proportion of the most intense tropical cyclones, while the total number of tropical cyclones will likely decrease. 2015, Union of Concerned Scientists, Hurricanes and Climate Change: Exploring the potential causes of increased storm intensity. Hurricanes, typhoons, and cyclones have always bedeviled coasts, but global warming may be making matters worse. Sea level is rising and will continue to rise as oceans warm and glaciers melt. 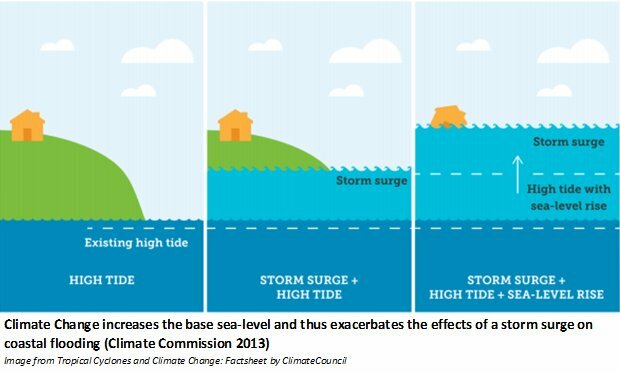 Rising sea level means higher storm surges, even from relatively minor storms, which increases coastal flooding and subsequent storm damage along coasts. In addition, the associated heavy rains can extend hundreds of miles inland, further increasing the risk of flooding. In a tropical cyclone, air rotates inward to the center (or eye), then rises to higher altitudes. As warm, moist air rises, the air cools and condenses to rain, releasing heat. This cycle of evaporation and condensation powers the storm. Image: Adapted from a figure courtesy of NOAA. Recent scientific evidence suggests a link between the destructive power (or intensity) of hurricanes and higher ocean temperatures, driven in large part by global warming. With rapid population growth in coastal regions placing many more people and structures in the path of these tropical cyclones there is a much greater risk of casualties, property damage, and financial hardship when these storms make landfall. Hurricane Behaviour: Meteorologists use the term “tropical cyclone” for a closed atmospheric circulation that forms over a tropical or subtropical ocean. Once maximum sustained wind speed exceeds 74 miles per hour these storms are called hurricanes in the Atlantic Ocean, typhoons in the Pacific Ocean, and cyclones elsewhere. Many factors influence tropical cyclone behaviour, but three factors must be present for them to intensify: warm ocean temperatures (hurricanes can occur when surface ocean temperatures exceed about 79 degrees Fahrenheit (26 degrees Celsius), low vertical wind shear (i.e., no strong change in wind speed or direction between two different altitudes), and high humidity. As warm, moist air rises, it lowers air pressure at sea level and draws surrounding air inward and upward in a rotating pattern. As the water vapor-laden air spirals in and rises to higher altitudes, it cools and releases heat as it condenses to rain. 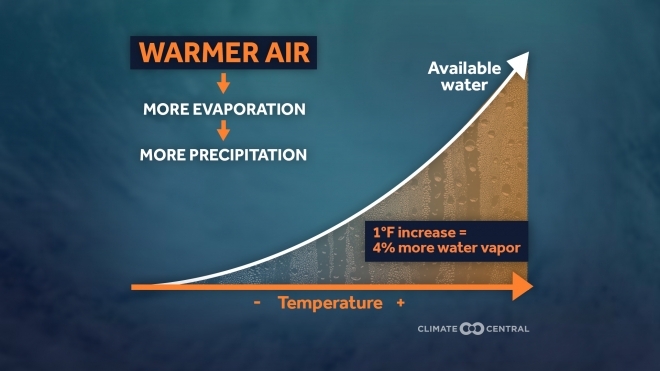 This cycle of evaporation and condensation brings the ocean’s heat energy into the vortex, powering the storm. There are several natural factors that can “put the brakes on” a tropical cyclone: moving over colder ocean water; strong winds that churn up colder ocean water; high wind shear that can diminish or destroy the vortex; dry air migrating to the hurricane’s core; and moving over land, which creates high frictional drag and deprives the storm of warm ocean “fuel.” But as long as conditions are favourable, the storm will thrive. The Effect of Global Warming: Two factors that contribute to more intense tropical cyclones-ocean heat content and water vapour-have both increased over the past several decades. This is primarily due to human activities such as the burning of fossil fuels and the clearing of forests, which have significantly elevated carbon dioxide (CO2) levels in the atmosphere. CO2 and other heat-trapping gases act like an insulating blanket that warms the land and ocean and increases evaporation. 14 May 2018, Carbon Brief, Climate change is already making droughts worse. Dr Benjamin Cook is a climate scientist at the NASA Goddard Institute for Space Studies and the Lamont-Doherty Earth Observatory. Few areas of the world are completely immune to droughts and their often-devastating impacts on water resources, ecosystems and people. Regions as diverse as California, the Eastern Mediterranean, East Africa, South Africaand Australia have all experienced severe – and, in some cases, unprecedented – droughts in recent years. As with other climate and weather extremes, such as storms and floods, these events have spurred strong interest in questions surrounding the impact of climate change. For example, is climate change making droughts more frequent or severe? And can we expect climate change to contribute to increased drought risk and severity in the future? The most recent research shows climate change is already making many parts of the world drier and droughts are likely to pack more punch as the climate warms further. Defining drought Droughts are among the most expensive weather-related disasters in the world (pdf), affecting ecosystems, agriculture and human society. The scale of the impacts underlines how important it is to understand droughts and how their likelihood and severity can be made worse by climate change. But this is easier said than done. For a start, drought is fundamentally a cross-disciplinary phenomenon – it extends across the fields of meteorology, climatology, hydrology, ecology, agronomy, and even sociology, economics, and anthropology. This means how you define a drought may depend on your field of interest. A meteorologist might characterise a drought as a straightforward lack of rainfall (known as “meteorological drought”). A farmer, however, would be most concerned when the lack of rain affects soil moisture and crop growth (“agricultural drought”). While a hydrologist would be most interested in when this has a noticeable impact on river flows, aquifers and surface reservoirs (“hydrological drought”). Read more here. Australia had its warmest winter on record, in terms of average maximum temperatures, reaching nearly 2ºC above average. More than 260 heat and low rainfall records were broken during the winter months. The nation experienced its second driest June on record and the driest winter since 2002. The exceptionally warm and dry winter was made 60 times more likely by climate change. Australia’s average winter temperatures have increased by around 1ºC since 1910, driven by climate change, as a direct result of burning fossil fuels – coal, oil and gas. Winter warm spells are lasting longer, occurring more often and becoming more intense. Climate change is likely making drought conditions in southwest and southeast Australia worse. Droughts have far-reaching impacts on health, agriculture and native species in Australia. Water scarcity will become an increasing challenge as the pressure on urban water supplies intensifies. Droughts are likely to worsen in severity and duration in southern Australia if greenhouse gas emissions are not cut deeply and rapidly. Drought can be defined in a variety of different ways. In terms of its links to climate change, drought is best defined as meteorological drought, which is ‘a prolonged, abnormally dry period when the amount of available water is insufficient to meet our normal use’ and is generally measured by assessing rainfall deficiencies over three or more months (BoM 2014c). In addition to meteorological drought, two other definitions of drought are used by different economic sectors or areas of research: agricultural drought, which is measured through deficits in soil moisture, and hydrological drought, which is based on anomalies in stream flow, lake and/or groundwater levels (IPCC 2012). Both of these definitions are important in terms of understanding the impacts of drought, and the consequences of climate change for these impacts. Drought has significant impacts on health, the economy, ecosystems and urban water supplies. Health: Droughts can have wide ranging effects on health including on nutrition, infectious diseases, on forest fires causing air pollution, and mental health problems, such as post-traumatic stress and suicidal behaviour (Haines et al 2006; Climate Commission 2011). Droughts can also contribute to increases in mortality rates. The World Meteorological Organization (WMO) has linked drought to 680,000 deaths globally from 1970–2012 (WMO 2014). Economic: Drought affects agriculture, tourism, employment and livelihoods in Australia, with severe economic repercussions. Between 2002 and 2003 decreases in agricultural production due to drought resulted in a 1% reduction in the Gross Domestic Product (GDP) and a 28.5% fall in the gross value added for the agricultural industry compared to the preceding year (ABS 2004). Ecosystems: Drought has significant impacts on Australia’s natural environment. For example, aquatic ecosystems are often affected by drought, with decreased water supplies reducing the availability of suitable habitat and leading to reductions in the populations of many fish and invertebrate species and, in some cases, contributing to local extinctions (Bond et al. 2008). Want to see potential impact of sea level rise 2100? Visit also the Canute website: Canute is a sea level calculator. A test site for potential new tools is available here (also provides distribution point for underlying data). Canute provides estimates of the likelihood of flooding from the sea during this century, taking into account sea-level rise and the effects of tides and storm surges and now offers a range of additional calculators. To find out more click here. Canute provides estimates of the likelihood of future flooding from the sea. By combining two uncertainties (the frequency of present storm surges and the uncertainty of future sea-level rise) into a single likelihood, a statistically robust prediction is generated. Canute allows you to select your location of interest from over 12,000 datapoints at roughly 2.5km resolution around the whole Australian coastline via a map interface. You then select a future greenhouse gas emission scenario and your time period of interest. The tool calculator will then output a graph indicating the probability of experiencing at least one flooding event during this period (red line) for a range of design heights. For comparison an equivalent probability curve for conditions of constant sea level (set at the value for the year 2000) is also plotted (blue line). 26 August 2015, NASA, Warming seas and melting ice sheets. Sea level rise is a natural consequence of the warming of our planet. We know this from basic physics. When water heats up, it expands. So when the ocean warms, sea level rises. When ice is exposed to heat, it melts. And when ice on land melts and water runs into the ocean, sea level rises. May 12, 2015, The Conversation, Sea level is rising fast – and it seems to be speeding up: have shown that sea level rose steadily over the 20th century – and at a faster rate than over the previous centuries. It is also clear from both satellite and coastal observations that seas have risen faster over the past two decades than they did for the bulk of the 20th century. More recently, several studies have shown that the flow of ice and water into the oceans from Greenland and West Antarctica has increased since 1993. This raises an interesting question: has the rate of sea-level rise changed since 1993, when satellite observations began to give us a more complete picture of the global oceans? Our new research tackles this question by comparing satellite observations of sea level with those measured at the coast by tide gauges. We use this comparison to determine small biases in the satellite data that have changed over time. Understanding how the land supporting the tide gauges is moving becomes an important part of these comparisons. We found three important results. First, the seas really have risen faster since 1993, relative to the slower rate over previous decades as evident in the tide gauge data. 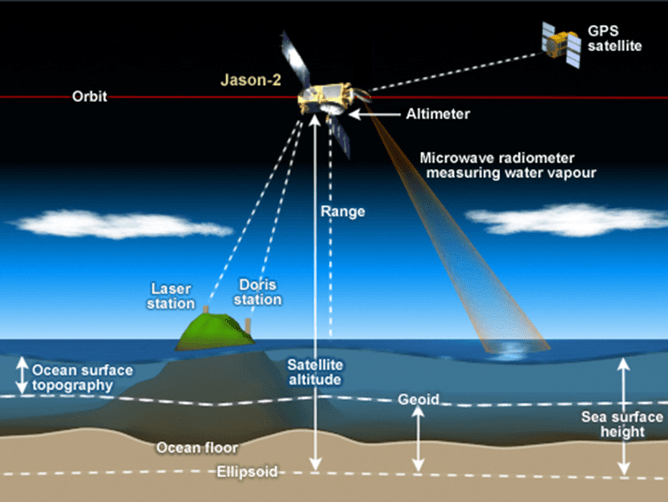 Second, comparison of the coastal and satellite measurements reveal small differences in the early part of the satellite record from 1993 to 1999. After allowing for land motion at the tide gauges, the first six years of the satellite record marginally overestimates the sea-level trend. Our revised estimate of global mean sea-level rise for the satellite era (1993 to mid-2014) is about 2.6-2.9 mm per year (the exact value depends on how we estimate land motion) – slightly less than the previous estimate of 3.2 mm per year. Australian Academy of Science: In past warmer climates, sea level was higher than today. Sea level was between 5 metres and 10 metres above current levels during the last interglacial period (129,000 to 116,000 years ago) when global average surface temperatures were less than 2°C above their values just before the start of the industrial era in the 19th century. The estimated contributions from ocean thermal expansion and a then smaller Greenland Ice Sheet imply a contribution also from Antarctica to this higher sea level. Globally, sea levels are currently rising. For two thousand years before the mid-19th century, the long-term global sea-level change was small, only a few centimetres per century. Since then, the rate of rise has increased substantially; from 1900 to 2012, sea level rose by a global average of about 19 centimetres. In the past 20 years, both satellite and coastal sea-level data indicate that the rate of rise has increased to about 3 centimetres per decade. A similarly high rate was experienced in the 1920 to 1950 period. 2014, Climate Council Report: Counting the Costs: Climate Change and Coastal Flooding. Australia is largely a coastal country. Much of our population lives on or near the coast, and our six state capital cities —Sydney, Melbourne, Brisbane, Perth, Adelaide and Hobart, as well as Darwin in the Northern Territory—are all port cities. In addition to the many lifestyle amenities from living on the coast, much of the nation’s critical infrastructure—transport, commercial, residential, defence—is located along our coastlines. Virtually all of this infrastructure has been designed and built for a stable climate with known ranges of variability. But the climate system is no longer stable. Sea levels are rising and so are the risks they pose for our coastal infrastructure. This report explores two of the most serious consequences of rising sea level—the large increase in the frequency of coastal inundation and the recession of ‘soft’ shorelines. Damage caused by increased coastal inundation and recession poses a massive financial burden due to damage and destruction of infrastructure. Coastal inundation and recession also have important implications for health and well-being, coastal ecosystems and communities. For a sea-level rise of only 0.5 m, flood events that today might be expected once every hundred years could occur every few months in the future. WHAT IT IS: About a quarter of the carbon dioxide emitted into the atmosphere is currently taken up by the oceans, where it reacts with seawater and forms carbonic acid. This “acidification” of global oceans is observed as lower pH levels. Since preindustrial times, the average pH of ocean surface water fell from 8.21 to 8.10. While that does not sound like much, that is a 30 percent increase in acidity, and it could decrease another 0.3 pH units by the end of the century. At that rate, it would create an ocean more acidic than any seen in the past 100 million years. 20 May 2015, Ove Hoegh-Guldberg, The University of Queensland Coal and climate change: a death sentence for the Great Barrier Reef. This article is the first in our series examining in depth the various threats to the Great Barrier Reef. Back in 1999, I made an upsetting discovery. By comparing the temperature tolerance of reef-building corals with the projected effects of rising carbon dioxide levels, I found that the oceans would soon grow too warm for corals to bear, meaning that coral-dominated systems like the Great Barrier Reef would disappear within 30-40 years. Much as I tried to find a mistake in my reasoning and calculations, the numbers kept telling me that one of the world’s most diverse ecosystems would disappear in my lifetime. As my study drew active discussion and debate, I desperately hoped that it was wrong and that the world had more time to solve the problem of climate change. Now, 16 years later, my conclusions have been confirmed and the message, if anything, have become even more pessimistic. Sea surface temperatures have increased rapidly by 0.85C from 1880 to 2012. In tropical regions, these changes have driven the destabilisation of the ancient symbiosis between corals and the brown micro-algae (dinoflagellates) that live inside them – a relationship that has driven the success of coral reefs for hundreds of millions of years. As temperatures rise, the dinoflagellates are damaged and are discarded, causing bleaching and leaving corals at increased risk of starvation, disease, and death. Meanwhile, ocean waters are acidifying at a rate that is unparallelled in at least the past 65 million years, potentially hampering the ability of coral reefs to maintain themselves through the all-important process of calcification. The consequences of these changes threaten to ripple up through one of the most complex ecosystems on the planet, affecting thousands of organisms from sponges to seabirds. In the process, they reduce the reef’s resilience to destructive events such as cyclones and non-climate-related human activities, fundamentally altering the food web and affecting opportunities for humans and industry. It is important to appreciate that these concerns are not the mutterings of a few scientists. The threat of climate change to coral reefs like the Great Barrier Reef is part of a major scientific consensus set out by the Intergovernmental Panel on Climate Change (IPCC), as well as by federal government bodies such as the Great Barrier Reef Marine Park Authority (GBRMPA) and the US National Oceanic and Atmospheric Administration (NOAA). There is no credible alternative prognosis that has survived the peer-reviewed process of science. Without wanting to sound too dramatic, the realisation that coral reefs such as the Great Barrier Reef are about to be thumped by rapidly warming oceans should have had us on our feet. Even if you don’t like or understand coral reefs, the dollars should have spoken to you. If we lose Great Barrier Reef, we lose a large part of the A$5 billion to A$6 billion it earns from tourism and fisheries, and with that many of the 60,000-plus jobs that this amazing ecosystem provides to Australia. If we look after the reef and don’t destroy it for short-term gains, we stand to reap those benefits, year after year, far into the future. There is growing international concern that the World Heritage-listed Great Barrier Reef is in danger of being damaged irreparably. With 50% of the corals gone, UNESCO’s World Heritage Committee has been pressuring the Australian and Queensland governments to increase their commitment to reversing the deteriorating health of the Reef. Later this year, the committee will decide whether to add the reef to its official “in danger” list – a prospect that has already been extensively debated here on The Conversation. The situation has prompted the state and Federal governments to unveil a long-term sustainability plan for safeguarding the Great Barrier Reef until 2050, with input from reviews by the Australian Academy of Science and others. While many elements of the plan are commendable it has also been criticised for its lack of firm, measurable targets, and adequate discussion of the implications of climate change. Climate caution, or business as usual? While the Reef 2050 plan does mention climate change as the predominant threat to the reef, it fails to link the problem to Australia’s plans to grow the coal trade, and to ship coal through enlarged ports on the Queensland coast. The reef plan only mentions coal in the context of local-scale impacts such as coal dust and port development. The plan briefly mentions Australia’s intention to cut greenhouse emissions by 5% on 2000 levels by 2020. But there is no mention of the billions of tonnes (gigatonnes) of carbon dioxide that will be released when Queensland’s coal is dug up, sold, and burned by other countries. The spectre of coal ships traversing the Great Barrier Reef couldn’t be more laden with symbolism. Coal extracted from the Queensland landscape, if burned along with other fossil fuel reserves, will ensure the destruction of the Great Barrier Reef. With only 500-800 gigatonnes of carbon dioxide left in the global carbon budget, beyond which we will push the climate into a dangerous state, the emissions from even a single mine can play a significant role. The Carmichael mine in the Galilee basin, for example, will pump out 4.49 gigatonnes during its lifetime. Given that the world’s reserves of fossil fuels are estimated to be capable of generating 2,500 gigatonnes of carbon dioxide, business-as-usual is easily capable of destroying the reef (pushing the added carbon dioxide well beyond the 500-800-gigatonne budget), along with many other ecosystems too. On the other hand, the negotiations over Australia’s greenhouse emissions are clearly separate from the deliberations of the World Heritage Committee. While it is almost certainly true that continual failure to act on climate change will mean the death of the Great Barrier Reef and every other coral reef, the question of how to curb emissions is obviously best handled by the United Nations’ climate negotiations framework, which is convening this year’s crucial Paris COP21 talks. Yet one could also argue that Australia should stand up as a nation and help lead the world away from this current dangerous climate trajectory. After all, if we know that adding more carbon dioxide to the atmosphere is extremely dangerous for the Great Barrier Reef, why would Australia deliberately put such a national treasure and economic powerhouse at risk by helping dig up even more carbon to burn from the Queensland landscape? If Australia is truly committed to preserving the Great Barrier Reef, it faces a tough choice: re-examine the current plans for unrestricted coal exports, taking proper account and responsibility for the resulting greenhouse emissions, or watch the reef die. Surely we as Australians have more foresight and chutzpah than to let that happen! Permafrost contains almost twice as much carbon as the atmosphere. As the Earth warms, permafrost thaws, releasing carbon dioxide and methane to the atmosphere. The amount and rate of this carbon release will greatly impact Earth’s climate trajectory. 27 August 2015, Woods Hole Research Centre U.S. scientists warn leaders of dangers of thawing permafrost. International policymakers gather in Alaska to discuss Arctic challenges. A QUICK SUMMARY: The Science Linking Arctic Warming to This Crazy-Cold Winter: It’s well known that the rapidly warming Arctic is melting sea ice, thawing permafrost, and accelerating sea-level rise. But a growing body of research suggests, counter intuitively, that it could also be amplifying cold snaps, much like the brutal one now freezing the East Coast. ANOTHER VIEW: US cold snap was a freak of nature, quick analysis finds. The cold snap that gripped the East Coast and Midwest region was a rarity that bucks the warming trend, said researcher Claudia Tebaldi of the National Center for Atmospheric Research and the private organization Climate Central. The average surface air temperature for the year ending September 2017 is the 2nd warmest since 1900; however, cooler spring and summer temperatures contributed to a rebound in snow cover in the Eurasian Arctic, slower summer sea ice loss, and below-average melt extent for the Greenland ice sheet. The sea ice cover continues to be relatively young and thin with older, thicker ice comprising only 21% of the ice cover in 2017 compared to 45% in 1985. In August 2017, sea surface temperatures in the Barents and Chukchi seas were up to 4° C warmer than average, contributing to a delay in the autumn freeze-up in these regions. Pronounced increases in ocean primary productivity, at the base of the marine food web, were observed in the Barents and Eurasian Arctic seas from 2003 to 2017. Arctic tundra is experiencing increased greenness and record permafrost warming. Pervasive changes in the environment are influencing resource management protocols, including those established for fisheries and wildfires. The unprecedented rate and global reach of Arctic change disproportionally affect the people of northern communities, further pressing the need to prepare for and adapt to the new Arctic. About the Arctic Report Card: Issued annually since 2006, the Arctic Report Card is a timely and peer-reviewed source for clear, reliable and concise environmental information on the current state of different components of the Arctic environmental system relative to historical records.The Report Card is intended for a wide audience, including scientists, teachers, students, decision-makers and the general public interested in the Arctic environment and science. Why does the Arctic matter to us? 17 October 2016, Yale Climate Connections: A new six-minute video on the changing nature of Arctic sea ice and its implications for weather far and wide answers the ‘Why does it matter to us?’ question. 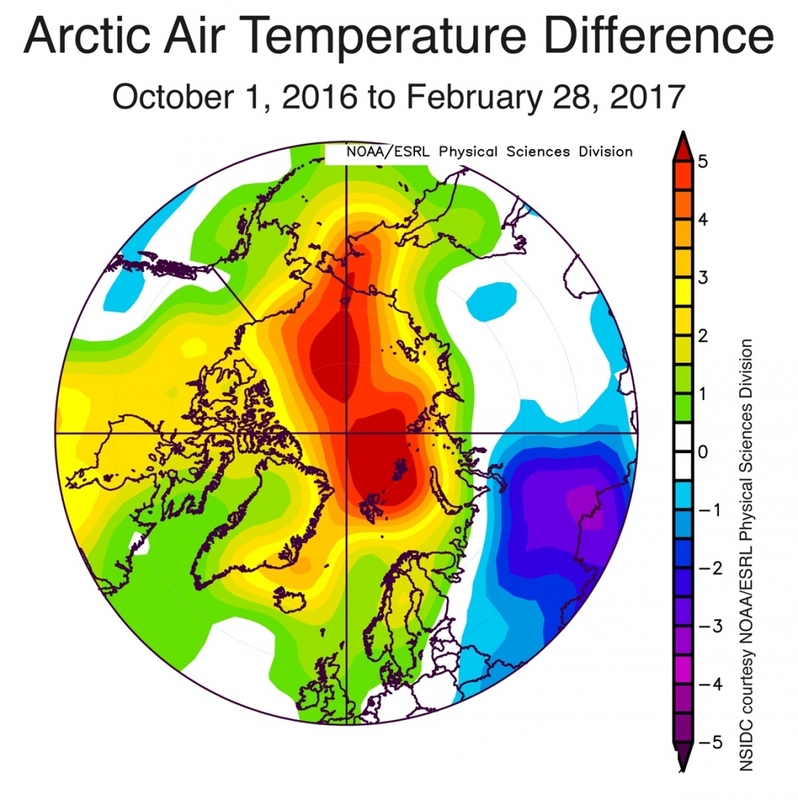 22 March 2017, Climate Central, Arctic Sea Ice Sets Record-Low Peak for Third Year. 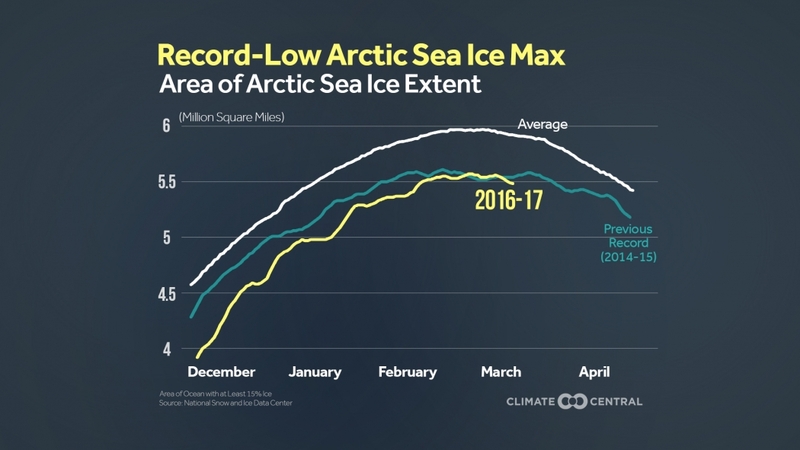 Constant warmth punctuated by repeated winter heat waves stymied Arctic sea ice growth this winter, leaving the winter sea ice cover missing an area the size of California and Texas combined and setting a record-low maximum for the third year in a row. Even in the context of the decades of greenhouse gas-driven warming, and subsequent ice loss in the Arctic, this winter’s weather stood out. “I have been looking at Arctic weather patterns for 35 years and have never seen anything close to what we’ve experienced these past two winters,” Mark Serreze, director of the National Snow and Ice Data Center, which keeps track of sea ice levels, said in a statement. 15 September 2016, NASA: The following animation shows the evolution of the Arctic sea ice cover from its wintertime maximum extent, which was reached on Mar. 24, 2016, and was the lowest on record for the second year in a row, to its apparent yearly minimum, which occurred on Sept. 10, 2016, and is the second lowest in the satellite era. Credit: NASA Goddard’s Scientific Visualization Studio/C. Starr. This video is public domain and can be downloaded from the Scientific Visualization Studio. 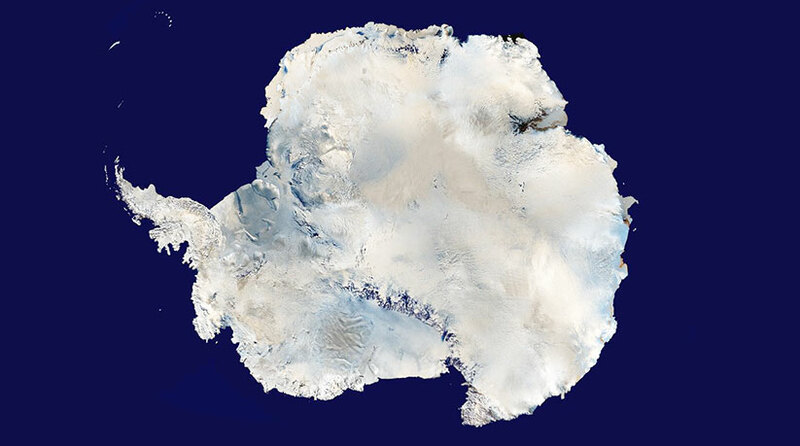 27 August 2015, Climate News Network, New NASA videos show stark ice loss from Earth’s ice sheets. The US space agency, NASA, yesterday released brand new images showing the pace of ice loss from Earth’s two vast ice sheets, Greenland and Antarctica.The amount of ice lost from the frozen expanses at the very north and south of the planet is accelerating, say the scientists, and together have helped raise global sea level by more than 7cm since 1992. 17 March 2015, The Guardian, Rapid Arctic warming is changing the Jestream and our weather along with it: There has been a lot of attention on the influence of rapid warming of the Arctic on weather in the Northern Hemisphere mid-latitudes. Much of the work has focused on changes to the Jetstream amplitudes and association of these changes to ice loss in the Arctic. We know that the Arctic is heating faster than the planet as a whole. Consequently, there is more energy in the Arctic which can be transmitted to the atmosphere. Much of the excess heat is transferred to the atmosphere in the late fall or early winter. This extra energy is connected to what’s called Arctic geopotential height, which has increased during the same times of the year. As a consequence, the Jetstream might weaken in the cold seasons. But what about summer? Have these changes been detected then too? Well just recently, a paper was published in that answered this question. 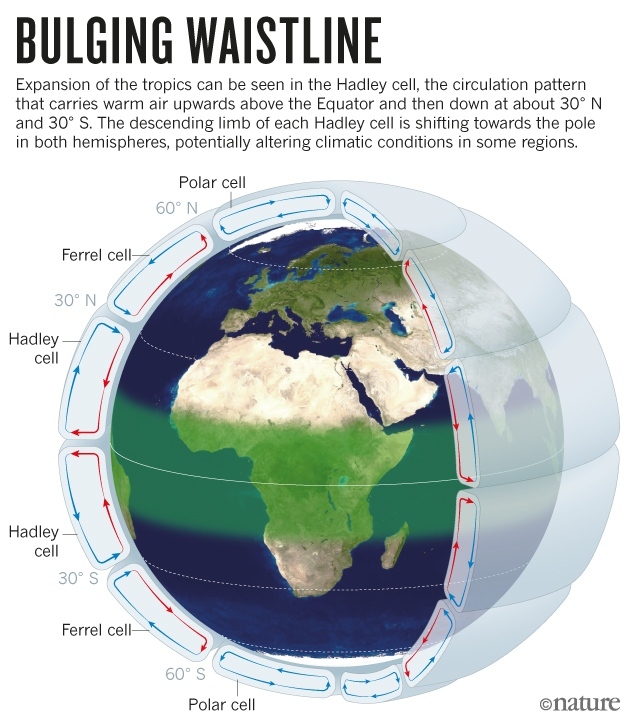 The authors, from the Potsdam Institute for Climate Impact Research and from the University of Potsdam reported on three measures of atmospheric dynamics (1) zonal winds, (2) eddy kinetic energy, and (3) amplitude of the fast-moving Rossby waves. Rossby waves are very large waves in the upper atmospheric winds. They are important because of their large influence on weather. The authors found that the summer zonal winds have weakened. The reason for the weakening is that since the Arctic is warming faster than the rest of the planet, the temperature difference between the Arctic and the lower latitudes is getting smaller. It is this temperature difference which maintains the wind speeds. The authors also found that eddy kinetic energy is decreasing. EIGHTH STORY – Arctic: A last great unprotected wilderness, safe haven for endangered species and home to native people whose subsistence lifestyle has survived in harmony with nature for thousands of years. It is here that Shell plans to drill for oil, pulling the detonator on a carbon bomb which eventually could spray 150bn tonnes of carbon dioxide into the atmosphere. Scorcher website has three main functions:to display where in Australia heatwaves are currently occurring; highlight recent and past heatwaves events for individual observation sites; and summarise information of past events at each site. Climate Change in Australia: A. Climate Change in Australia (or CCIA) is a comprehensive website and suite of reports providing information about climate change projections for Australia. This body of work updates the previous CCIA research published in 2007. NOAA From supercomputers and state-of-the-art models to observations and outlooks, we provide data, tools, and information to help people understand and prepare for climate variability and change. CO2 – Earth CO2.Earth is here to track the atmospheric CO2 trend along with you. Any time you want an update for earth’s planetary vital signs, CO2.Earth points to the latest numbers.